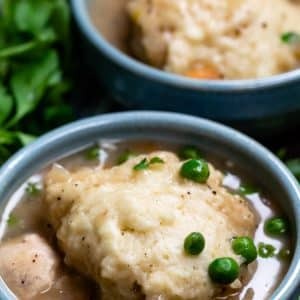 Easy 30 minute Chicken and Dumplings is the perfect soup for dinner! This is a lower calorie chicken and dumplings recipe that’s full of flavor! Growing up I absolutely LOVED Chicken and Dumplings. My mom made the recipe from the Betty Crocker cookbook often and I looked forward to that meal my whole childhood. As an adult I started making my own chicken and dumplings and wanted to make something more like a soup instead of a stew or thick and rich recipe. 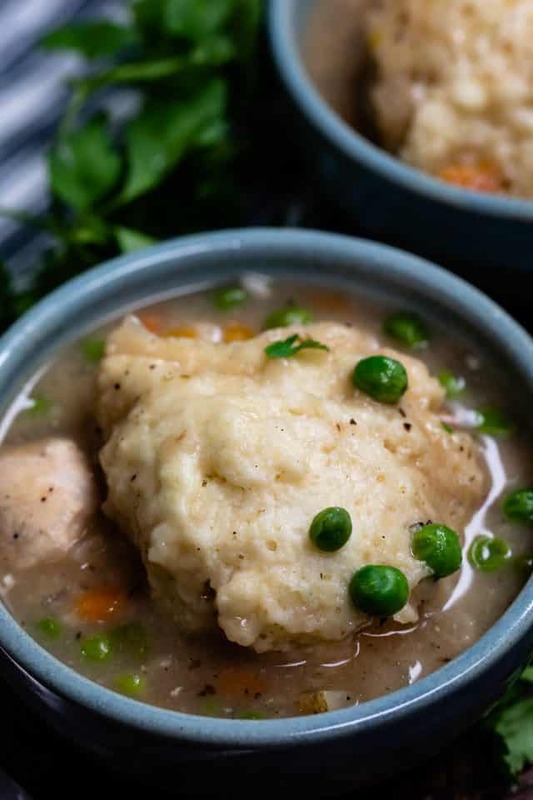 I wanted all that delicious chicken and dumplings flavor but with less calories and a little bit healthier and that’s how this recipe came about. I’ve been making my chicken and dumpling soup recipe almost my entire marriage and I hope that you’ll love it as much as we do! This soup recipe shows up often in the fall and winter and we look forward to it every year. Chicken and Dumplings Soup is a homemade 30 minute meal that’s the perfect dinner! My homemade chicken and dumplings recipe is much more of a soup than a stew or thick chowder. It’s broth based with just a bit of flour, making it a teeny bit better for you than the traditional thicker recipe. Making soup like this in 30 minutes means you need to spend some time cultivating the flavors so there is a depth to them; oftentimes soups made in a short amount of time lack flavor. This one doesn’t! 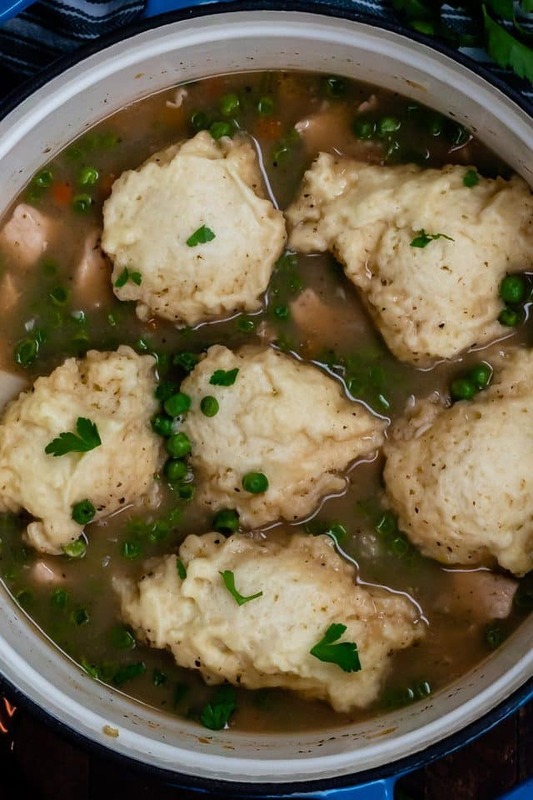 What’s the secret to making 30 minute chicken and dumplings? I am sure to cut my chicken into small bite-sized chunks. No one wants to have to cut the chicken in their soup! I brown the chicken pieces before I start the soup. This seals in the juices of your chicken so it won’t be dry. All of my favorite soups start with sautéed onion, celery, carrot, and garlic. This adds a wonderful fresh flavor to the soup. Be sure to use a good quality chicken stock or broth (Trader Joe’s and Kitchen Basics are my favorite). I always use low-sodium so I can control the amount of salt in my recipe. I add a potato for some extra starch, along with just 2 tablespoons of all purpose flour. Adding the potato lets me add less flour and while a potato is also a carb, it’s healthier than flour! The result is a chicken and dumpling soup made in under 30 minutes! Want another semi-homemade cheat? 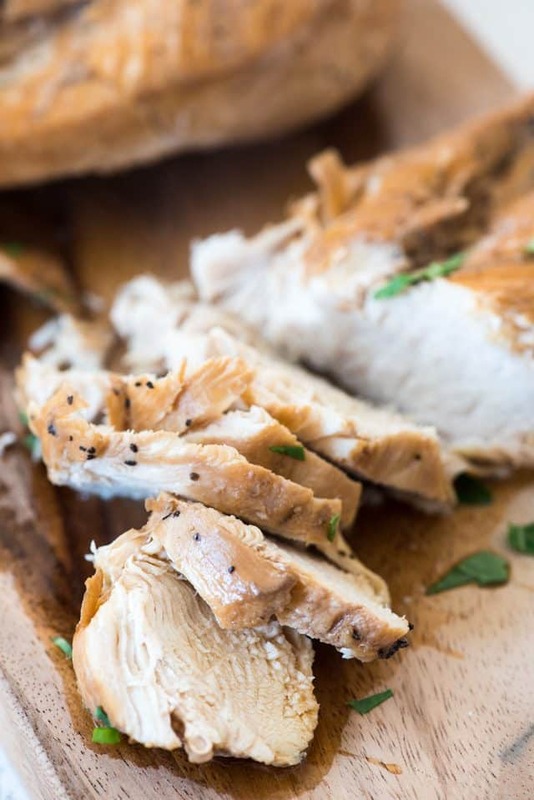 Sometimes I use rotisserie chicken or leftover baked chicken for this recipe. Just throw it in with the peas and you have an easy soup recipe that comes together even faster. My biggest tip for making soup at home in under 30 minutes: taste it. Be sure to taste it as you go to test the seasonings. Salt, pepper, and Italian seasoning go a long way to making this soup taste like it cooked all day! Easy 30 minute Chicken and Dumplings is the perfect soup for dinner! This is a lower calorie chicken and dumplings recipe that's full of flavor! Heat 1 tablespoon olive oil in soup pot over medium high heat. Season chicken with salt and pepper (about 1/2 teaspoon each). Add the chicken and brown on all sides, about 3-4 minutes total. Remove chicken from the pan. Add second tablespoon of olive oil to the pan. Cook onion, celery, and carrot for two minutes, stirring often. Add the garlic, cook one minute. Add the potato, salt, pepper, and Italian seasoning and cook for another minute. Stir flour into vegetables and cook one minute then stir in chicken stock. Stir to remove anything stuck to the bottom of the pan. Cover and bring to a boil. Meanwhile, make the dumplings by stirring all ingredients for the dumplings in a medium sized bowl. Mixture will be thick. Set aside. Boil soup for about 4-5 minutes then add the chicken back to the pan. Cook until potatoes are fork tender. Add the peas to the pot and stir. Drop dumplings into the pot using two spoons. This recipe makes about 6 dumplings, unless you want them smaller or larger. Cover the pot and cook until the dumplings are cooked, 8-11 minutes. Serve hot. If you want semi-homemade help with this recipe, use Bisquik baking mix for the dumplings. I use the dumpling recipe on the side of the box sometimes and it makes it easier to not have to make them from scratch. 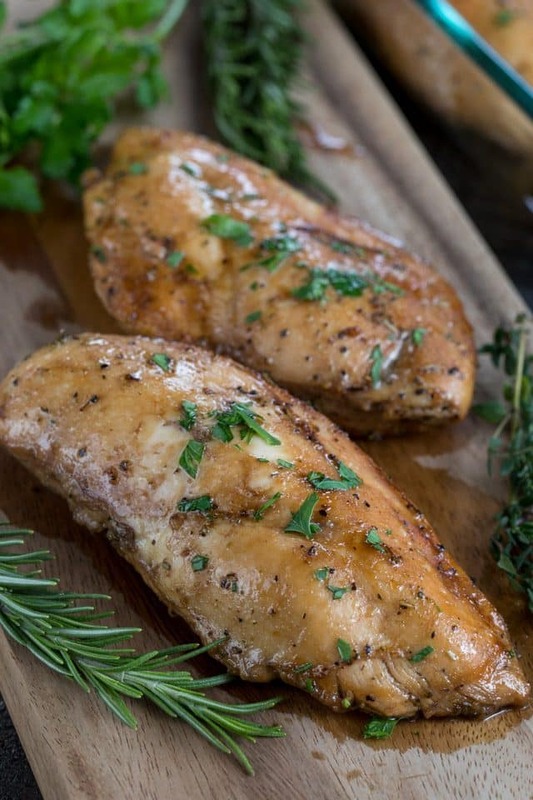 Have leftover chicken you want to use up? Skip cooking the chicken and add the already cooked chicken into the pot with the peas and dumplings. Cook until hot.